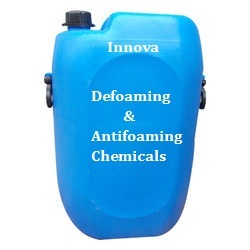 Innova Corporate (India), We are one of the leading Exporters, manufacturers in Assam, Suppliers and Dealers of Dofoaming Chemicals from delhi based, we deals in finest quality of Dofoaming Chemicals in Assam, manufacturers of Dofoaming Chemicals, dealer of Dofoaming Chemicals, suppliers of Dofoaming Chemicals, Dofoaming Chemicals, Dofoaming Chemicals manufacturer in Assam, Dofoaming Chemicals Suppliers in Assam, Dofoaming Chemicals dealer. Silicon based broad-spectrum antifoam demonstrating effectiveness in a variety of applications. It excels in evaporative wastewater treatment, and is a strong performer versus numerous types of detergent foam. It is particularly effective in the agriculture industry to control foam in herbicides and spray adjuvants. And it has also found utility in chemical manufacturing, water treatment, industrial process water, and some types of cleaning products and coating formulations. Silicon antifoam is a water-based emulsion containing a complex mixture of silicones and non-silicone active ingredients. This combination provides rapid and aggressive foam destruction, and persistent foam suppression in many types of foaming media. The product is readily dispersible in water with gentle mixing, and is generally more rinsable than a conventional silicone antifoam. Innova produces silicone, synthetic and ester based products for use in a wide range of fermentation processes. Whether your process is aerobic or anaerobic or whether your media is fungal or bacterial. Whether you are working at the laboratory scale or industries; we have the defoamer to fit your process. Innova fermentation defoamers are non-toxic to fermentation media and do not inhibit oxygen transfer. Fermentation Industries Served : Enzyme, Amino Acids, Lysine, Citric Acid, Yeast, Ethanol & Gums. We perform defoamer testing using multiple apparatus to simulate the causes of foam in your system. Through recirculation, diffused air flow, mechanical agitation or chemical reaction we generate foam in our test equipment. Once we establish the most applicable test method and sample point in your system, we screen products for 'knock down' "how quickly foam is dismantled" and 'suppression' "how long before foam returns". The optimum products excel in both functions. Our thorough defoamer testing process allows us to create the best possible custom product for your system.